More often than not, our campers live in a world that tells them no. 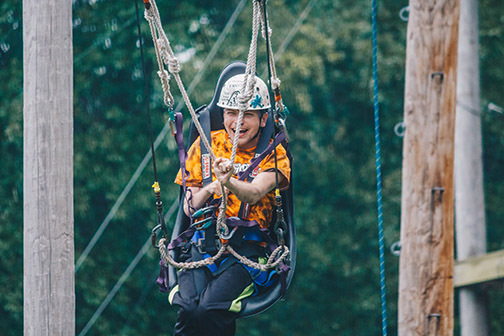 At Camp Barnabas, we get to say YES to activities like a high ropes course, archery, swimming and more. 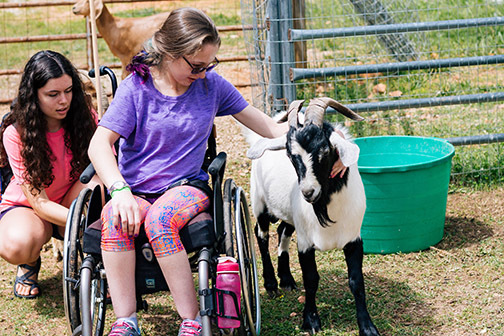 One of our core initiatives is to ensure all of our summer camp activities are accessible and designed so that anyone, regardless of ability, is able to participate. 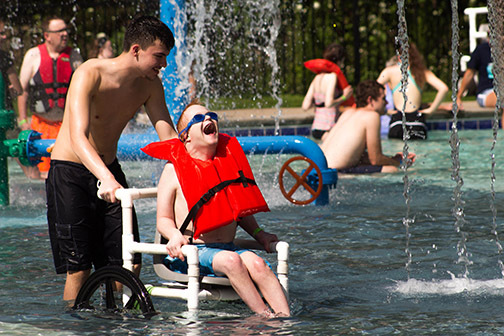 Zero Entry Pool: We are equipped with water wheelchairs to help give campers the full pool experience. Additionally, our pool includes an extra-wide slide to accommodate campers who might need additional support riding down. 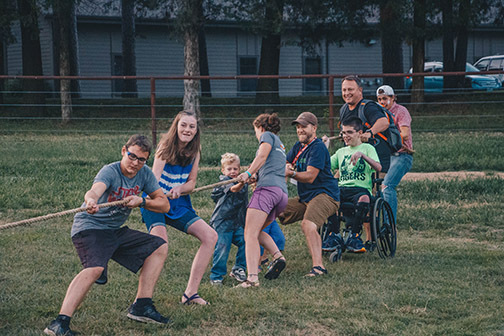 We want all campers to have the option to experience this fun summer activity, so we work strategically and safely to utilize staff, volunteers, and medical team to assist those in doing so. High Ropes Course: Our high ropes course was once the largest accessible ropes course in America! It includes a rock wall up and a zip line down. 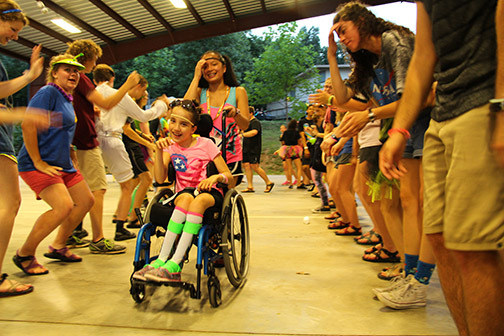 In order to access it, campers who utilize a wheelchair are transferred out of their wheelchair into a specially designed seat with harnesses, ropes, and comfort padding. Safety is paramount for Barnabas, which is why helmets are still required, even with the secure safety seat. Staff then utilizes a pulley system to bring individuals into the air and through the ropes course. Campers can choose two routes, one ending in a zip line and the other ending in a giant swing. Campers can opt out at any point in the course and be brought back down. At a minimum, two Barnabas Extreme Team members are in the air with the camper, pulling them through the ropes course. These individuals have over 40 hours of training. In addition to typical ropes training, they have 30 hours of accessible high ropes training. Archery: Campers with a range of abilities can participate in this classic recreational activity. For those with less upper mobility, we have a modified crossbow option that includes a button to shoot/release arrows. Rifles: This is also a classic summer camp sport that we’ve made accessible. Just like archery, for those with less upper mobility, we have an option to press a button to shoot. 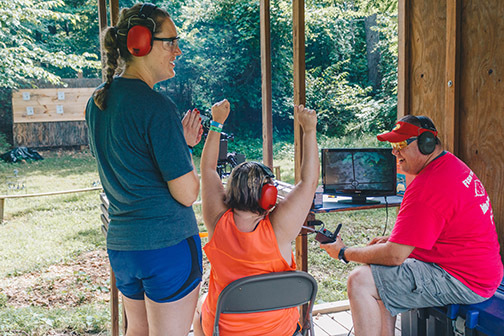 We also partner with an organization that brings in technology that allows campers the ability to blow through a straw or push a button to shoot a 12 gauge shotgun at a target. 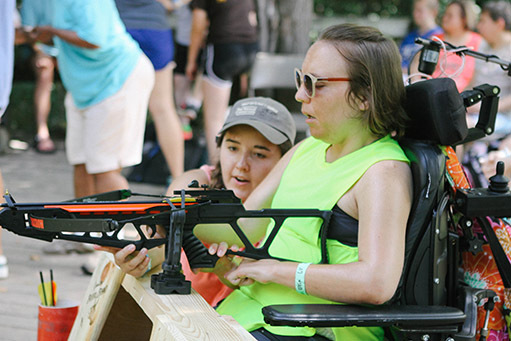 Paintball: We have a wheelchair friendly course with targets for campers to aim and “paint” their targets as they shoot through the course. Pet Set: Our Teas Trail location has lots of fun at our mini-petting zoo featuring our miniature horses and goats. Campers are encouraged to visit, groom, pet, and spend time with these sweet animals. 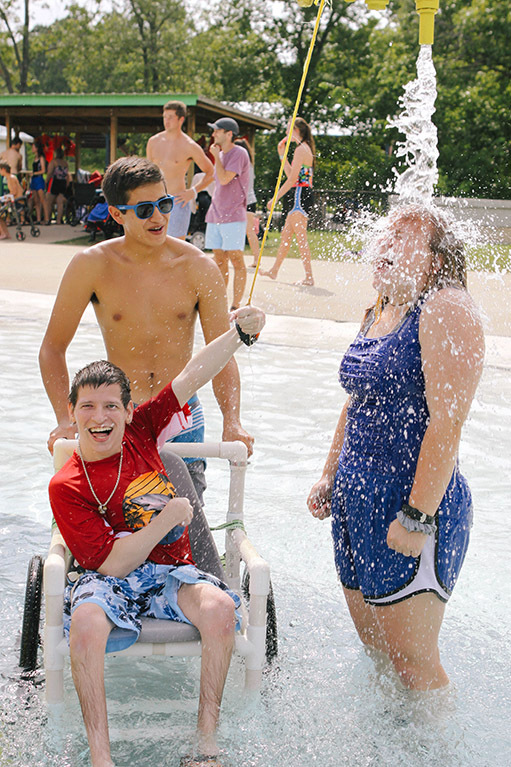 MISC Activities: Outside of these, Camp Barnabas also offers arts and crafts, music and dance, gardening, karaoke, accessible field games, spirit activities and more. Nightly Celebrations: Each day ends with a themed celebration that includes dress-up parties, dancing, carnival activities, pool parties, and other group games to foster camaraderie and inclusion. 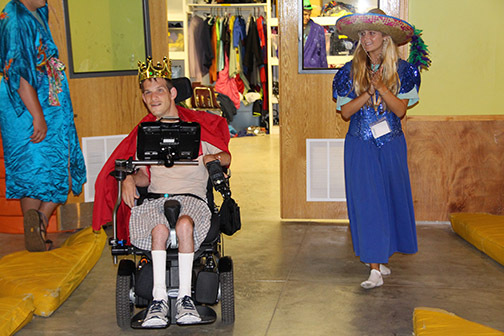 No matter your diagnosis or ability, our goal at camp is to provide a fun, joyful week of inclusion! If you have any specific questions about our camp activities or camp accessibility, please contact Jason Frazier, Chief Operations Officer, at [email protected].